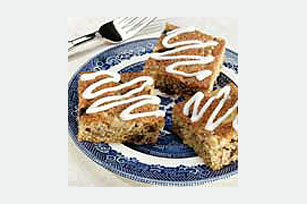 These cinnamon-scented bar cookies laced with chewy raisins and crunchy walnuts make a scrumptious dessert or snack. Mix flour, cereal, baking powder and cinnamon in small bowl; set aside. Beat brown sugar and margarine in medium bowl with electric mixer on medium speed until creamy. Beat in eggs until smooth. Stir in flour mixture until blended. Add 1/2 cup of the chopped walnuts and raisins. Spread mixture in lightly greased 13x9-inch baking pan. Sprinkle with remaining 1/2 cup chopped walnuts. Bake at 350°F for 20-25 minutes or until golden brown. Cool completely in pan on wire rack. Drizzle with Powdered Sugar Glaze. Cut into bars. Substitute PLANTERS Pecans for walnuts.